It’s all over the news: two drinks a day is a ok. That’s if it’s alcohol cause if you’re consuming 2 fizzy drinks a day, well then, that’s a whole different story. Then there’s the news about the value of resveratrol in wine. Well, that along with my Italian heritage was all permission I needed to justify enjoying a glass of wine (or two) an evening. Last October I decided to go coffee free for the month. This was born out of the awareness that we have become a society where needing the jolt in the morning has become acceptable. At the same time I found I was needing more of the kick yet enjoying it less. I was the sort that a part of my night routine was to prepare my morning coffee maker. My favorite was ground freshly and the timer set to go off precisely 10 minutes before my alarm. I would lay in bed contemplate hitting a snooze button, then my senses would pick up the aroma of my fresh jolt waiting for me. Drag myself down the stairs, barely awake, the brown liquid poured into my favorite mug. Although it seemed like in an instant when I am certain it was more a gradual process that I was unaware of, I had an epiphany that I was needing this more than enjoying it. May of this year I did a 5 day detox. That in itself had a joke……”heck if I can’t have wine I may as well go to bed!” Interesting how during those 5 days I would have THE BEST SLEEP. I have done this program before and am well aware of the power of it. This time around my results were very disappointing. I was baffled and yes a tad frustrated. My one daughter made a comment about it “being my age”!!!! My age! My age! My whole life all needed to do is talk to my metabolism and it fires up! I haven’t experienced a “weight problem” for 3o years. Ah yes, I thought a bit more calmer……… my age. This is very similar to when another daughter was a preteen; I reminded her that right now as a 11 year old, she can eat ice cream every day, BUT there will come a time when that will not serve you. Between being in the process of, or right at the doorstep of menopause, there’s a lot of “stuff” going on. My liver is working pretty darn hard right now. Something needs to change!!!! The same awareness that carried me to the doorstep of coffee free, is carrying me to Sober In October. “Sober? But mom you’re not a drunk” – 16 year old daughter. Interesting, that society says it’s acceptable to have the couple of glasses a day. 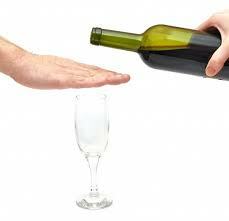 WedMD says that one of the signs of alcohol abuse and/or dependency is that “You feel like you must drink just to get by”. Being honest with ourselves is a huge first step: I don’t need the glass of wine to get by BUT I do recognize that I need the glass of wine to relax. A recovering alcoholic to talk about dependencies. In sharing my intention today with my naturopath, the last thing she said to me was that she was glad I was doing this.